Tear Us Apart is a Canadian film production produced in Toronto, Canada and shot on location in Mississauga and Gravenhurst Ontario. Produced by Envoi Entertainment, in association with Phase 2 Entertainment and Back of the Sun Media. A veteran filmmaker with over 14 years experience working in the industry. Devin has led and worked on features, documentaries, corporate videos, dramatic stories, short stories, film contests, and web series. Drawing from a strong educational background from Vancouver Film School, and work at the Incubator Studio in Toronto Devin is well versed in all areas of filmmaking. Some highlights include working as an assistant editor for TV shows Degrassi and Winging it, directing TV pilot Tugg & Chugger, and running his successful production company: Phase 2 Entertainment. Francesco is a Canadian born London based independent filmmaker, and founder of the production company Envoi Entertainment. Working as both a Director and Producer Francesco's slate of films spans both narrative and factual, feature length, and short form. Francesco is best known for his work on genre films: Tear Us Apart, and Into The Grey, as well as the feature length documentary Refugee. Accomplished writer, director, and first AD with over 10 years experience in the business working on films at various levels. Most notably, Harman has worked on feature films: Mystic (Director), and Little Terrors (Associate Director). As well as written and directed two short films for Envoi Entertainment. Winner of the PAGE International Screenwriting Award for Science Fiction and a Top 25 Finalist in the Tracking Board's LaunchPad Competition, John Kelley is an experienced, accomplished screenwriter, with scripts deals and options with Chris LaMont Productions, Envoi Entertainment, Picture Machine Productions, Rockaway Productions, Seven Cities Media, Spit Shine Flicks, and Phase 2 Productions. Accomplished Cinematographer that has an established career spanning work in film, TV, corporate video, and digital content internationally across Serbia, England, LA and now Canada. Milijan holds a Masters in Cinematography at the American Film Institute, and has worked with leading brands such as: FOX, Paramount, ESPN, Discovery, VISA, and T-Mobile. Most notable has been Milijan’s work on shows like ‘The Six Sense’ and ‘Letter By Letter’. An accomplished composer and pianist, Kevin has worked on various original music compositions for the entertainment industry. Most notable on the feature film Extraction Day and Coming Distractions TV Series. 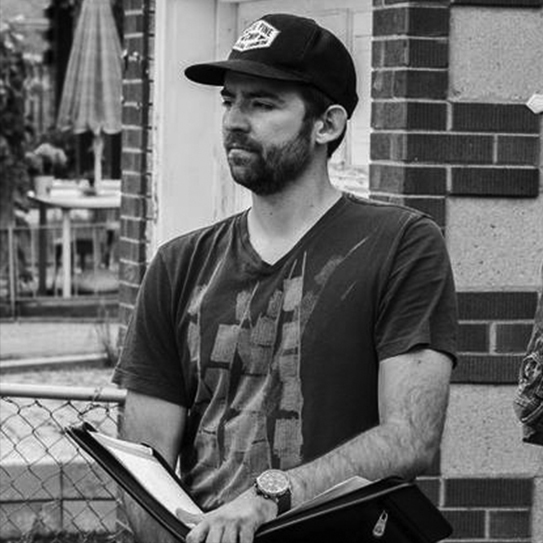 Kevin is along time collaborator of Director Devin Clarke and has worked closely to compose music for Devin’s short films including: 11th Commandment of Copyright, Stay Warm and Girl of my Dreams.